While on the hunt for a relatively inexpensive yet good Cab, I was introduced to this at my local Whole Foods store. I had just picked up a few NY Strips to grill and remembered that my everyday drinking collection was kind of slim on choices. I hadn't heard of this wine and neither had Tommy who was working the bar that day. (We're lucky to have one of the few wine & beer bars inside a Whole Foods store.) So Tommy said we should try the wine as he was thinking about adding it to the bar for tastings and by-the-glass purchases. He proceeded to open the bottle before I could say a word. The next thing out of my mouth, after the first taste left me a bit speechless...as it did him. Wow, holly crap, this is amazing...probably a few things I remember uttering quietly as others watched on. So now on to the bottle I opened for dinner. The aromas at first had a hint of alcohol but diminished quickly. 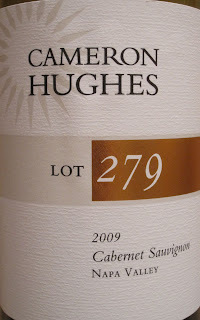 Predominant smells of black currants, dark cherries, licorice and vanilla pretty much sum up this robust California Cab. On the tongue, dark berries and soft tannins had this tasting like it was a $60 wine. The finish is clean with hints of dark chocolate and toasted wood.